You're on a road trip, checked into your hotel, but just don't feel like going out to dinner. There's an interesting-looking Thai restaurant not too far away but they don't deliver. Well, your food options just got bigger. TripAdvisor and Grubhub have announced a linkup making it easier and faster for TripAdvisor users to order food from nearby restaurants using Grubhub's delivery service. TripAdvisor is integrating Grubhub's delivery app into its desktop website, mobile web and mobile app experiences. Consumers who are browsing through TripAdvisor's restaurant listings will be able to order from tens of thousands of Grubhub's restaurant partners in 1,100 cities. All you have to do is click "Order Online." That will bring up Grubhub's online or mobile platforms from which you can place an order. Bertrand Jelensperger, senior vice president, TripAdvisor Restaurants, says there are more than 4.2 million restaurant listings currently on TripAdvisor. That, he says, has helped the app become instrumental in helping both travelers and local residents choose a place to eat and make a reservation. The Grubhub hook-up, he says, is a natural extension. "Through our new agreement with Grubhub, we're demonstrating another example of how TripAdvisor has become the site for anyone looking to find their perfect meal, now providing consumers with access to food delivery from tens of thousands of restaurants," he said. 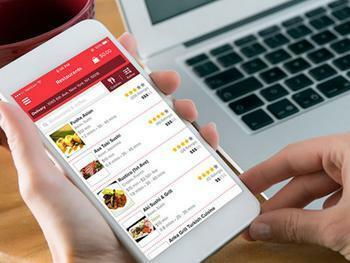 For its part, Grubhub says it's always looking for ways to make it easier to find food sources, whether people are on the road or relaxing at home.